The EyeArt system is the most extensively validated AI technology for autonomous detection of diabetic retinopathy, tested in the real-world on more than half million patients and nearly two million retinal images globally. The EyeArt AI Eye Screening System makes in-clinic, real-time diabetic retinopathy (DR) screening possible for primary care practices, diabetes centers and optometric offices by allowing physicians to quickly and accurately identify referable DR patients during a diabetic patient’s regular exam. Any physician can quickly and accurately detect referable diabetic retinopathy patients during a diabetic patient’s regular exam with a report that is generated in less than 60 seconds after submission of patient images. EyeArt can be seamlessly integrated with your clinical workflow to enable automated DR screening. Click below to get started. The EyeArt AI Eye Screening System makes in-clinic, real-time DR screening possible. Any physician can quickly and accurately detect referable diabetic retinopathy patients within minutes during a diabetic patient’s regular exam. Once the patient fundus images have been captured and submitted to EyeArt, the DR screening results are available to view and export to a PDF report in less than a minute. Demonstrates over 91% referable DR screening sensitivity and specificity in a retrospective study of over 100,000 consecutive patient visits, with over 98.5% sensitivity in identifying patients with potentially treatable sight threatening DR.
EyeArt is the most extensively validated AI technology in the world. It has been tested in a clinical validation study on over 100,000 patient visits, one of the largest data sets used to test any available DR screening technology, in demanding, real-world clinical environments using images captured in everyday practice. It has also been independently validated by UK NHS in a study with over 20,000 patients. Tufail et al. “Automated Diabetic Retinopathy Image Assessment Software - Diagnostic Accuracy and Cost-Effectiveness Compared with Human Graders.” Ophthalmology 124, no. 3 (March 1, 2017): 343–351. Solanki et.al. “Clinical Validation Study of an Automated DR Screening System against 7-Field ETDRS Stereoscopic Reference Standard.” In AAO 2016. USA, 2016. Solanki et.al. “Comprehensive Clinical Validation Study of a Fully-Automated Diabetic Retinopathy Screening System Using Color Fundus Images against 7-Field ETDRS Stereoscopic Reference Standard.” In 16th EURETINA Congress. Copenhagen Denmark, 2016. Fully automated DR screening, including imaging, grading for DR in accordance with internationally recognized standards and reporting, in a single office visit. No specialist needed for DR screening. EyeArt also flags poor quality images or images not showing the required retinal fields (protocol deviations) automatically. 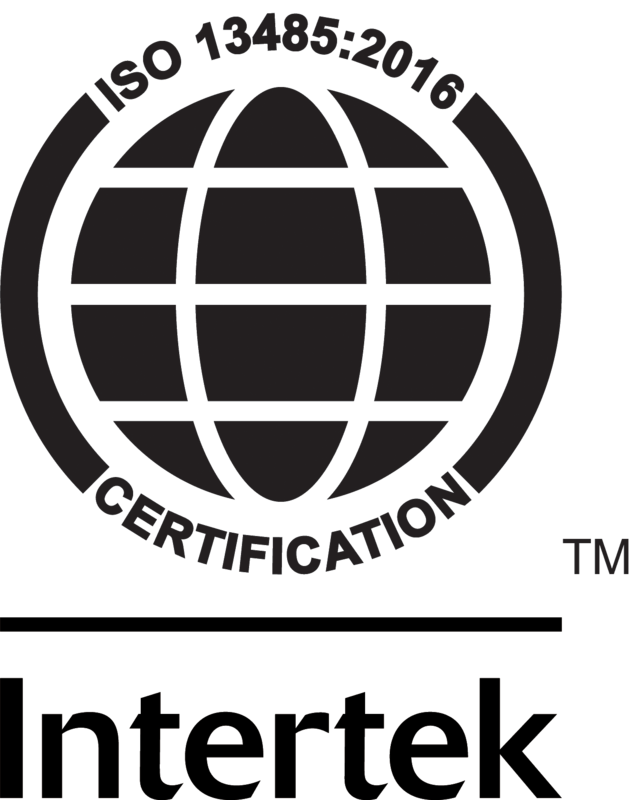 EyeArt provides grades as per the International Clinical DR (ICDR) severity scale. For many OUS markets EyeArt can be configured to provide grades as per UK NHS' s National Diabetic Eye Screening Programme (NDESP) severity scale. When images of poor quality, or of insufficient retinal coverage are detected, EyeArt provides an ungradable output along with the reason in less than 1 minute, allowing the clinic to re-photograph the patient as needed. The technology is designed to work effectively with image quality commonly encountered in diabetes patients and with imaging protocols/cameras typically used in screening setups. EyeArt is HIPAA compliant and keeps all data secure and private. EyeArt system's RESTful API allows for seamless integration with 3rd party software and systems such as electronic health/medical records (EHR/EMR), picture archival and communication systems (PACS). Out-of-the-box integration with fundus cameras from Canon, Topcon, and Nidek allows EyeArt to automatically pull retinal color fundus images soon after image capture and directly submit them to the cloud for DR screening. The EyeArt system has been designed to readily work with images from most table top color fundus cameras. Please contact us to find out if your camera is supported with EyeArt. The EyeArt system autonomously analyzes patient's retinal images to robustly detect lesions and signs of disease and returns an easy-to-read report in under 60 seconds. 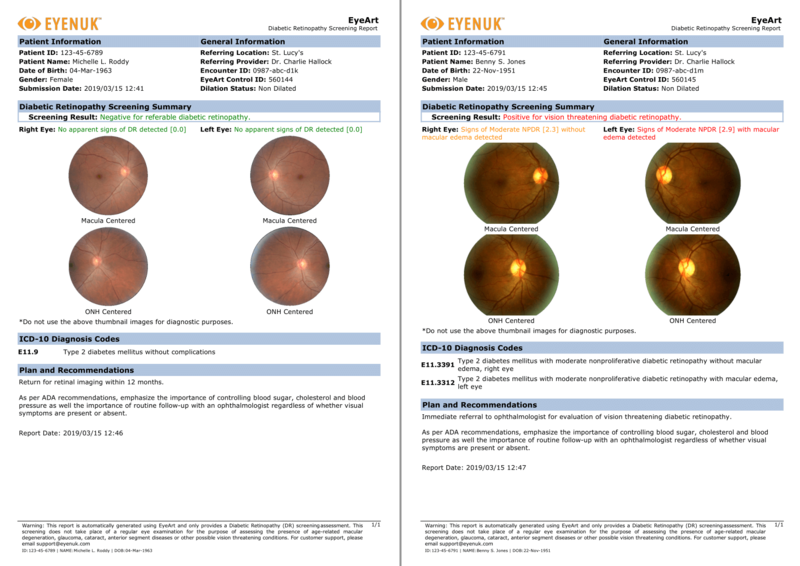 The report provides eye level and patient level diabetic retinopathy outputs and also indicates presence or absence of referable DR or vision threatening DR.
Click on the image to view sample EyeArt reports. Our image analysis algorithms represent cutting-edge of research in image processing, computer vision, and machine learning. Technological innovations like multi-scale morphology-inspired filter banks are used with advanced deep learning algorithms to detect and localize lesions resulting from diabetic retinopathy. EyeArt system's encrypted data storage and communication ensures that your data remains secure and private. EyeArt system has been independently audited to be HIPAA compliant. Its RESTful API design enables seamless integration with existing electronic health record (EHR) systems and picture archival and communication systems (PACS) for secure operation. Development of the EyeArt system was partially supported by prestigious National Eye Institute (NEI/NIH) grants (EB013585, EY026864, EY027241) totaling over $4.1M USD. In addition, the NIH also partially funded Eyenuk’s U.S. clinical trials for EyeArt. Eyenuk has collaborated with the Doheny Eye Institute, Los Angeles and with EyePACS from the earliest stages for the development of the cloud-based EyeArt system. The EyeArt AI Eye Screening System was developed with funding from the US National Institutes of Health (NIH) and is validated by the UK National Health Service (NHS). 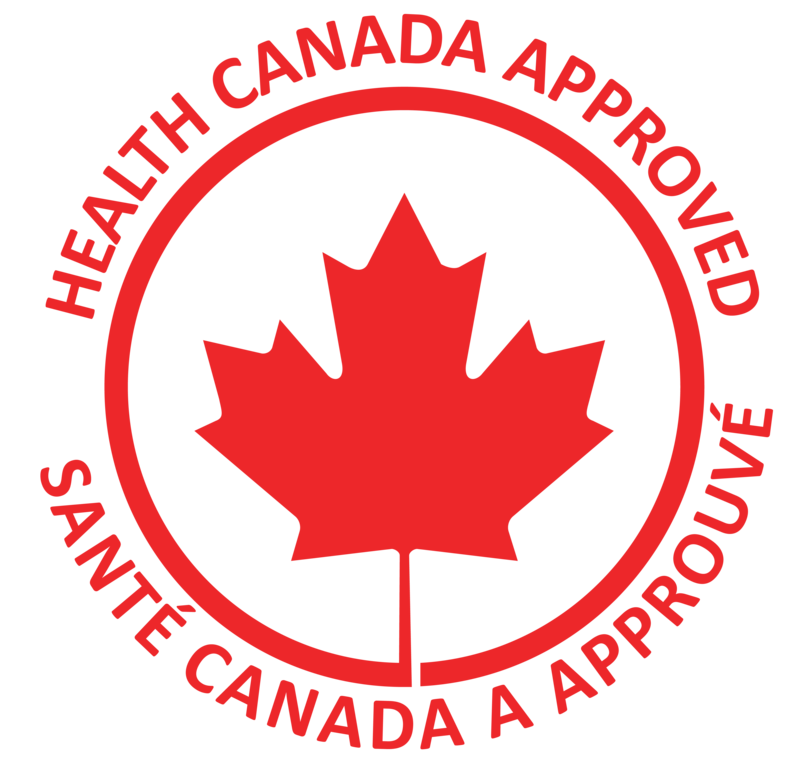 The EyeArt System has CE marking in the EU for sales as a Class IIa medical device and a Health Canada license for sales in Canada as a Class 2 device. In the US, the EyeArt System is limited to investigational use only. For use in other countries, please contact us. If you are interested in knowing more about EyeArt or trying EyeArt for yourself, click on the button below to fill a short form and someone from our team will get back to you promptly.